“I didn’t really know what the score was and just focused on my own game and then at the end I was like, ‘seven shots – okay’ that’s awesome,” laughed Lim. Lim doesn’t have much time to celebrate before heading back to school tomorrow morning to live a normal life with all her friends in Auckland. 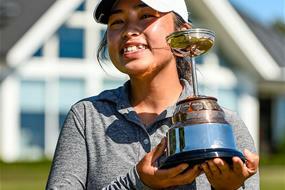 Although Vivian Lu fell short it was another great week for the New Zealand Amateur champion who continues to show her growth, while Wellington’s Darae Chung took out third place.